This is our new 100% polyester microfiber washable adult bib. It is 18" wide x 30" long and features a hook and loop (similar to Velcro® Brand) neck closure. 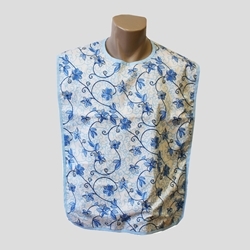 The bib features a beautiful blue floral pattern with a heavy weight light blue binding. 100% polyester scrim on the back adhered to a vinyl waterproof back barrier.